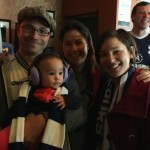 Baby Eliza enjoyed her 2nd game at the Atlantic Bar, equipped with fetching purple earmuffs. Eliza was very happy all day, especially after a great win and a Soldado goal. 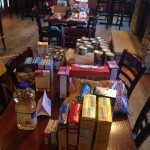 The Chicago Spurs Thanksgiving proved a great success. 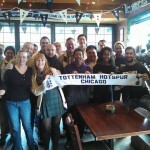 The Atlantic Bar hosted the event and everyone have a wonderful time and Spurs provided the perfect present with a win. Many thanks to the Atlantic Bar and Jon for being fantastic hosts. Come celebrate Thanksgiving with Chicago Spurs and take in the Partizan Europa match. The Turkey will be provided by The Atlantic Bar & Grill. Please let us know if you plan on attending on the Facebook event. Also let us know if you plan on bringing a side dish. The Board of Chicago Spurs held a club meeting meeting on the 11th of November 2014. For a full list of items discussed please see the Chicago Spurs Facebook Group. 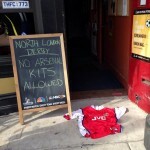 In order for us maintain the high standards of cleanliness of the Atlantic Bar and Grill, a convenient door mat was placed at the front door for the North London derby.